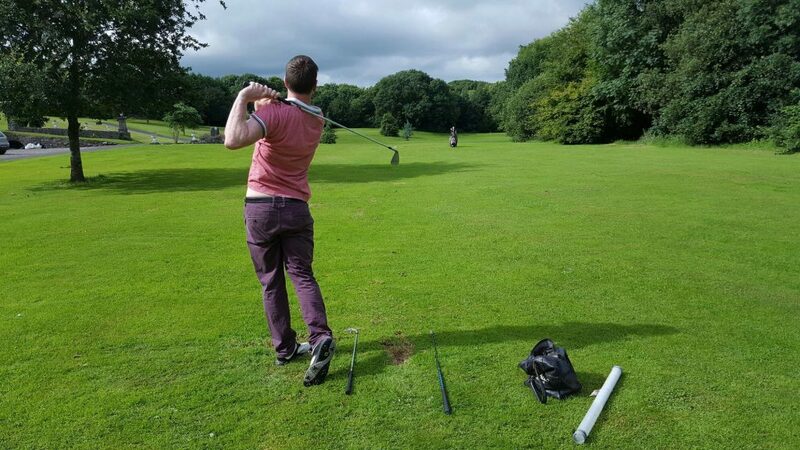 The following piece was posted on boards.ie by a golf lesson customer and I am really delighted with his results. As I have posted before, I have been hooking the ball for the best part of 4 years now. Initially, it wasn’t too bad but it just got worse and worse. I gave up golf last year only playing 3 or 4 times. I went back to it with gusto this year and am playing nearly every week. Same problem though, even worse. I have looked online, read up and went for a lesson with a well-known pro. No joy! I was about to pack it in but went to the range for one last time. I had a bucket of 60 balls. After hitting 25 hooks in a row I asked the guy next to me would he mind taking a video of me with my phone. We got chatting and he recommended a pro in Glanmire called John Dooley. I thanked him and continued to hit the rest of the balls. In all 2 out of 60 were good, the rest were hooking with the exception of the driver where one in 3 were snap hooks!! I said, what the heck, I’ll give this guy a go and if he can’t fix it then I’m giving it up. I made my appointment for the Monday evening and turned up as planned. John runs the lessons from Riverstown House in Glanmire, a big, beautiful old house. Out front, he has built a fairway with 3 greens. So, we meet and he explains the plan. He sets up his camera and asks me to hit a few balls. After the 2nd shot, he had it diagnosed. He brought me around to the camera and we watched my swing. To my untrained eye, I thought it was good enough actually. I do have a nice, smooth swing and it looked OK. John pointed out I was standing to upright and I was taking the club back inside. I kinda knew this but it wasn’t until he had me hitting a few with me squatting (as I thought it was) that I realised. I felt sorry for John as he tried so many things to try to get me to take it back straight, but every time I took it back on the inside. We did lots of turning exercises and eventually he had me hitting irons with the ball on a high tee and then I started hitting them well. They were really good and not like anything I’ve hit before. I was deflated though as the ball was up on a 2-inch tee. He gave me great exercises to do and I’ve done them every day. I went to the range 3 nights afterwards not expecting much. I got 60 balls again. 40 of them were better than I have ever hit the ball. 5 were heavy (but ok & straight) and 5 were hooks. I decided to play yesterday evening ever though I probably should have held off until after at least my next lesson. It was a lovely warm evening and my Dad was going to so I said what the heck. I played 14 holes I’ve never hit it so well! There’s a par 3 where we play that’s usually a decent 7 iron to the front for me. I hit an 8 iron and saw it land on the green. Both myself and my Dad couldn’t find it (I even checked the hole but no joy). I was about to just carry on but took a walk around the back of the green…there she was after rolling off. I had 4 pars in a row at one stage. To say that I’m ecstatic would be an understatement. I have another 3 lessons booked in as I want to really embed this “new” swing. John’s details are below and I would be very comfortable recommending him.